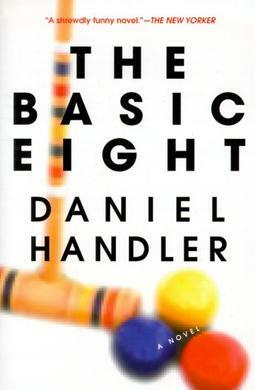 I’d never heard of The Basic Eight before and picked it up super cheap on the kindle, but it turned out to be the sort of book I get absolutely obsessed with. Books about high schools, cliques and privileged teens are amongst my very favourites if they’re done well (or even sometimes if they’re not). Prep by Curtis Sittenfeld is one of my all-time favourites and a book I would recommend to anyone, and this is in a similar sort of vein. I wouldn’t say it’s a feat of literary genius, exactly, but it is extremely compelling: I absolutely couldn’t put it down. On a basic level, the novel is about a group of friends – “The Basic Eight” – in a San Francisco high school, the particularly gruesome murder that they are involved in (not a spoiler, I swear! ), and the events of the year leading up to said murder, all told retrospectively by our hero (or anti-hero? ), Flannery. I actually didn’t realise this while I was reading it, but The Basic Eight‘s author, Daniel Handler, is also Lemony Snicket. I was never really into the Series of Unfortunate Events books which is probably why I didn’t realise the link, but now that I know I can see that the tone is quite similar, albeit older. Handler’s protagonist Flannery has a tone that you won’t forget for a while: she’s sarcastic without being annoying and just funny enough for the subject matter. Handler mixes the mundane with the incredible very easily and it makes for a great read – his characters move from French lessons to extravagant evening soirees to absinthe-fuelled parties with total ease. One of my favourite things about the novel was the fact that it is entirely undated. I was completely and genuinely surprised to find, when I looked it up halfway through reading, that it was actually written in 1998 – you could have told me it was released last month and I would have believed you. Usually “teen” books are, by necessity, very of the present moment, but this seems basically timeless. It doesn’t seem jarring at all that the characters aren’t using Facebook or Twitter or even texting, which is refreshing when a lot of novels today are crammed full of twee references that seem awkward and out-dated a year after publication. The Basic Eight is deeper and darker than your average high school novel, and it has a perfect twist: the sort of twist that you sort of see coming, but not really (or maybe I’m just naive), and one that makes you want to immediately go back and re-read the whole thing. Along those lines, this book also made me really want to talk about it. There are a lot of little things that Handler does that inspire discussion, from the faux-discussion questions at the end of each chapter to the apparent media treatment of Flannery to unreliable narrator issues to general conspiracy theories about the whole novel. It’s very post-modern and self aware and I thought it was fab. I’ve since seen The Basic Eight compared to Donna Tartt’s The Secret History, which I tried to read last year and failed, but maybe I will give it another go. I’m certainly going to try Handler’s other adult novels. If TBE is anything to go by, he has a style and a knack for detail that is right up my street. I’m not sure if it’s still reduced on Amazon, but this is a novel that I’d even consider paying full price for, so if you’re even vaguely interested I’d say give it a go!